A weather underworld: Reigate trapped under an anticyclonic gloom! Anti-cyclonic stratocumulus cloud continues to blanket Reigate and the SE of England in a cold, gloomy weather underworld. A temperature inversion (where temperatures rise with height, instead of fall) at 1000 metres is trapping any rising air which inhibits convection spreading out the cloud mass to cover the entire sky: good to reduce rainfall, bad for any views of the sun! Regrettably no light at the end of the tunnel yet: the north-easterlies circulating round the HIGH pressure to the North are likely to continue for much of the week and bring in blankets of stratocumulus cloud from the North Sea. 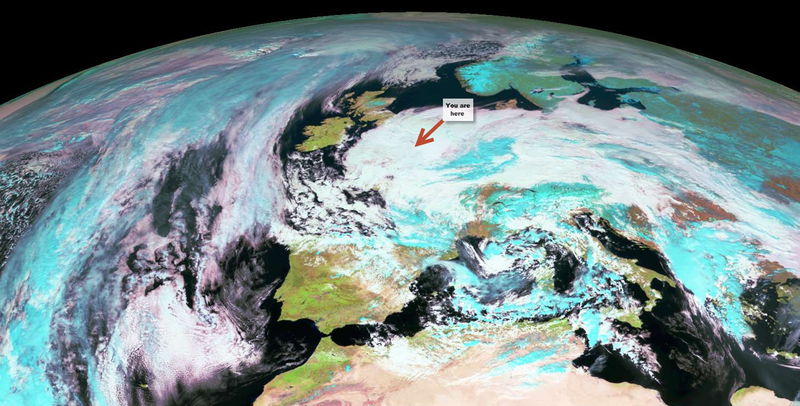 This spectacular view from the EU Meteosat satellite today at midday clearly shows the cloud blanket voering SE England from 22,300 miles away. Temperatures will struggle to exceed 5C in the days to come; this time last year temperatures were well above 12C and even hit 17C on a few days.